"Protct Kirby, no matter what." The above info came from Tiff, and was edited by yours truly (contact me). The image came from kirbycat89. Meta Knight was supposedly the last remaining Star Warrior. He survived the last war the Star Warriors ever fought against NME's (Nightmare Enterprises') monsters. 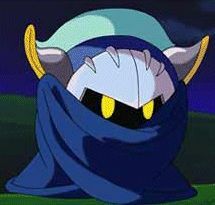 After Meta Knight realized he was the only Star Warrior who survived Nightmare's rebellion, he then travelled the galaxy in his starship in search of young Star Warriors. During Meta Knight's travels he was joined by Sword and Blade, and his search eventually brought him to Planet Popstar. When Meta Knight found King Dedede had interest in ordering monsters from NME he swore his loyalty and services to King Dedede and stayed in Dreamland hoping a another Star Warrior would come. Meta Knight usually stays in the shadows unless he needs to give advice or help Kirby out. It is unclear on how Meta Knight knows so much about Kirby but his mysterious knowledge and wisdom has helped Kirby, Tiff and Tuff on matter of numerous occasions. He knows about the Warp Star and where Tiff hid it in Kabu. He also knows that Tiff truly cares about Kirby because she can call the Warp Star when Kirby needs it most. In the movie, Kirby: Fright to the Finish, we learn that there are indeed other Star Warriors. In the video game, Meta Knight's eyes are only yellow when his mask is on. Once his mask comes off, his eyes are red and white. Apparently in an episode it is revealed that the Star Warriors were formed over 50,000 years ago, and since Meta Knight was one of them it follows that he must be over 50,000 years old.